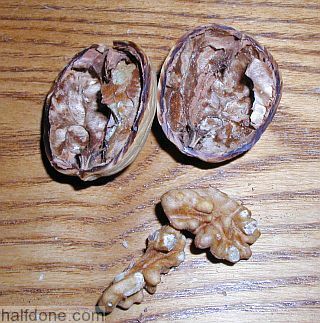 Crack open a walnut without breaking the inside part. 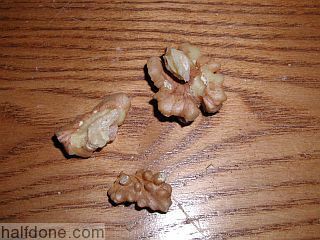 If you ever ate a walnut you know you have to smash open one with either a Nut Cracker, hammer or my favorite as a kid, my bedroom door hinge. Invaribly you end up smashing most of it into pieces. Had you ever thought of tring to break one up but the insides still be whole? 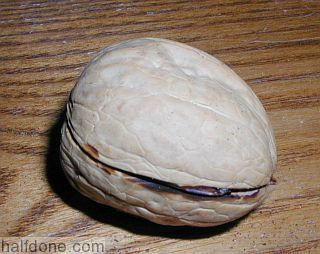 Since the shell is very hard you need a way to cut into the shell and not break the very delicate center connection of the 4 quadrents of nut inside. Also the shell actually devides these sections with a thin wall complicating the job even more. Since with the right powertool you can cut anything I got out the Dremel. My first attempt was to just cut the shell in half. Well this didn't work very well. 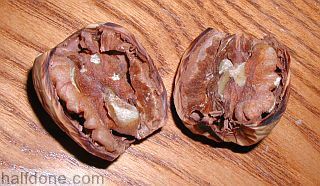 It easily split the whole nut in half. While the wall sections are very thin it appears to be enough to worry about. Taking a closer look you can see the walls have a hardsection where they meet in the center end points. For my 2nd attempt I cut these ends off which also gave me an advantedge in that I might have enough room to remove the walls from the wholes. 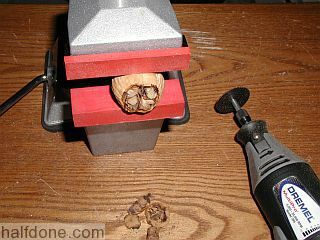 Placing another walnut on my vice I the dremel like a table saw and removed the ends. I cut too much and actually cut into the inside nut so this one failed but I used it as practice. I removed as much of the walls as I can using plyers. Getting cutters I chipped away at the shell. Seems that I did break this one at some point since it was in two but the center part did stay with the largest part so it was the closest I got. The 3rd time I cut the ends off a bit smaller so I don't hit the insides. It was much harder to remove the walls though. I then cut around the whole shell and found it still broke. 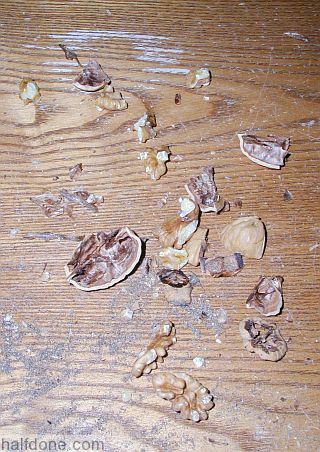 For my last walnut I had fun and attempted to crush it in my vice. The shells are harder then you expect. Had to use quite a bit of force until it exloded. Soaking in water in attempt to soften it, unsure this will work since cutting into it is like cutting into hardwood flooring and smells just as bad. Page last modified: June 20th, 2005 - 5:17pm Boston, USA time. 5,217,769 Hits on this page since July 20th, 2003. Page loaded in 0.007 seconds.